The secluded villa provides a taste of rural unspoiled Portugal. Quinta da Madrugada, is perched on a hillside in 12 acres of private woodland and terraces just waiting for you to explore, and is surrounded by small rural villages deep in the heart of central Portugal. The sweeping good quality tarmac roads and off road tracks through woodland and mountains make this an ideal get away for cyclists and walkers, and of course for those who would like to lounge by the private 8 x 4m salt water 'vista' swimming pool and feel that they have climbed a mountain, but have not actually had to do so. This well equipped villa is located on the edge of the Serra da Estrela Natural Park and has far reaching sensational views over the river Alva valley and up to the Serra da Estrela mountains (The Mountains of the Stars), which is mainland Portugal's tallest mountain range.The land is surrounded by numerous river beaches which are very popular in Portugal with the clear, pure mountain rivers. english, We are busy learning Portuguese. My name is Stephen and I own and run Quinta da Madrugada with my wife Elizabeth. We are both English, but moved to beautiful Portugal in 2011 to enjoy a quieter life and to run a small tourism business. When we first saw Quinta da Madrugada it was a piece of unloved land that had been unoccupied for over 40 years. The buildings consisted of not much more than piles of stone, but the location and views took our breath away! We re-built what was the farmhouse into the Quinta using as much of the original stone as possible but with the added benefits of double glazing, central heating, wood burning fire and solar panels. From a blank canvas we have created a real "home from home" with far reaching mountain views a private pool and nature on your doorstep. When you stay at Quinta da Madrugada you happiness and privacy is utmost to us. My wife and I live in a little house hidden from your view some 300 meters away. You will see an absolute minimum of us, but we are at hand if you need help/advice. Send us a shopping list and we will have your supplies all ready in the kitchen/fridge for your arrival, so all you have to do is relax. It has been said many times now..."staying at Quinta da Madrugada is good for the soul". As the house is only a couple of years old all the bathrooms are modern and hygienic. Hand soap and towels are provided. We are in the peaceful and unspoilt heart of rural Portugal, surrounded by swathes of oak and pine forest, breath-taking mountains with clear rivers and numerous small quaint villages. Quinta da Madrugada is set on a hill in over 5 hectares of nature with far reaching views over the Alva river valley and up to the Serra da Estrela mountains (mountains of the stars). The Quinta has full central heating provided by radiators which are heated by the wood burning stove. High quality 400 count Egyptian white cotton linen provided. Bedding changed for you weekly. There is not a washing machine in the Quinta. One wash per week can be facilitated by the owners. More washes available for a small service charge. There is both a rotary outside clothes drier and an airer. White Hand, Bath and Bath sheet towels provided. Pool/Beach towels also provided. Wood burning stove with free fire wood. Open plan living room with three sofas. A four ring Halogen hob. The oven is convection and is integral within the Microwave. The Microwave is also used for convection cooking and also has a grill function. Nestle Dolce Gusto coffee machine and Cafeteria. Basic spices and sauces provided, plus kitchen foil, cling film, kitchen roll. All necessary pots, pans, plates and cups provided. Plus a hand held blender and Slow cooker. Tropical hard wood dining table and chairs, positioned in front of large panoramic windows. In the living room, showing Portuguese and English language programs. Guests are welcome to read the books in our small collection, covering many topics/genres. Scrabble, Dominoes, Playing cards, Backgammon, Boules. The garden consists of over 5 Hectares/12 Acres of private land, partially wooded with oaks. Two of the bedrooms have their own small balcony. There are several flat areas around the Quinta that are paved with loose stone. Smoking is allowed only outside of the building. 8M x 4M pool for the private use of the guests. The pool is filled with spring water and has a salt chlorinator to keep it in top condition. The pool has far reaching panoramic views. The owners live approx 300M away, which is far enough away to respect your privacy, but close enough to offer help, advice or indeed sometimes a lift back from the village bar! Could not have asked for more from the hosts, very welcoming yet we were left complely in peace to enjoy our break. Accommodation was very spacious and included all mod cons. View from the property across the mountains was a treat to look at everyday. Swimming pool was the ideal way to keep cool on the hot days and like the salt cleaner over standard chlorine approach. Local walks to both both Avo and Santa Ovaia were a nice way to take in the local scenery. thank you so much for a lovely review, it is very much appreciated. It was such a pleasure having you stay with us and we very much hope to see you again. We had a wonderful stay at Quinta da Madrugada. We stayed there for a week and we were made feel very welcome by Elizabeth and Stephen, who are truly wonderful hosts. The house has everything one needs to spend a fantastic holiday. We loved the view, the pool, the privacy. Should one wish to explore the region, there are also many lovely cities and villages a short driving distance away so it has a truly excellent location. We recommend staying at Quinta da Madrugada to everyone wishing to just relax but also to those that wish to explore beautiful Portugal! thank you so much for staying with us, it was really lovely to meet you all. The review is very kind and very much appreciated. We wish you all the very best and hope to see you again either here on your return trip or even in Estonia! We are a couple who stayed in Quinto Da Madrugada the first two weeks in June 2018. We used the house as a base for the exploration of the area and as a place to relax. The weather was unusually poor for the time of year which meant that we spent more time at the house than we normally would have done. It was fortunate that we liked the house as much as we did. This is a lovely house. It is clear how much thought and hard work has gone into converting the original plot into an attractive modern building. The bedrooms are large, comfortable and, as in the rest of the house, tastefully furnished. The main en-suite bedroom, which we used, is roomy and practical. The living space/ kitchen is large and comfortable. The impressive panoramic French windows offer a spectacular view of the fabulous view of the mountains when relaxing inside. The kitchen is equipped with everything we needed for our stay. All good quality and everything worked. We had no issues with any of the utilities at any time. The immediate outside area is attractively landscaped and well maintained. It offers a large choice of places to relax depending on weather, time of day etc. All of these with the aforementioned fabulous view. We enjoyed using the large barbecue and outside eating area when we could. We were able to get lots of use out of the pool in spite of the relatively unseasonable weather, and were able to make use of the sun loungers and shade when the sun finally came out. Nice pool. The Owners Stephen and Elizabeth are lovely people and kind and accommodating hosts. Their welcome was relaxed and genuine and they were a pleasure to deal with throughout. We don’t know when we will be visiting this area of Central Portugal again, but are certain that when we do we would only consider renting Quinto Da Madrugada. thank you so much for staying with us and being such wonderful guests, it really was a pleasure. As for the review - well there aren´t enough words to thank you enough! We really do look forward to having you stay again the next time you are in the region. In the meantime, keep well and all the very best to you both. The area has lots of beautiful little villages to explore, small bars and restaurants dotted around to try (and it’s so cheap! ), although the river beaches weren’t up and running as it was early May, they looked very beautiful and definitely a reason to come back as our daughter would love to play all day in the sand! Some of the roads are interesting and the track up the house is steep in places but it all adds to the wonder and adventure of North Portugal. We can’t recommend the villa enough, it really is a credit to Stephen and Elizabeth. They turned their dream into a beautiful reality for all to share and enjoy! Thank you so much for staying with us and for such a lovely review. It was a genuine pleasure to meet you all and to make your stay as comfortable as possible. We are so pleased you enjoyed the quinta and the area and it would be great to see you again....but please pack for hubby next time as I am running low on sunglasses! Keep well until next time. This house is located in the area where in 2017 there was a horrible wildfire. Hundreds kilometers of forest was burnt. Unfortunately, we didn’t know about it before our arrival. All we could see from the panoramic window is scorched forest :(. Photos of nature around the house posted on Homeaway are made before this wildfire and don't correspond to reality. We had to spend our time at house or go far away, because already a few meters from the house all trees were burnt and it was unpleasant to walk around that area. As for the house, it is large, beautiful and modern. Please note that there is no Wifi in the house and no dishwasher. Also, we did not see the washing machine, although it is in Amenities. In two bathrooms the shower is not fenced off and when you take a shower, all bathroom becomes wet. In addition, the runoff in both these showers doesn’t work well. The road to the house from main road is ONLY for advanced drivers. It is a dirt road, washed out by rains. The road is not illuminated, in some places it is rather narrow with large stones on either side. At the same time, it goes at a sufficiently large angle upwards. On this road we damaged our car when we drove along this road for the first time. Our vacation was spoiled and the hosts did not even give us a discount for the discrepancy between our expectations (according photos) and the real view. My advice is think twice before choosing this house and ask owners to send real photos of the house area. The fire was on international news last year, additionally we advised you personally in writing when you booked to stay with us (the same e-mail where we advised that the WIFI is temporarily unavailable due to upgrades). The holiday villa is surrounded by green oak trees and green land, of course other people are still clearing their land, this is a heavily forested region and it takes time to clear the pines; the oaks and other broad leaf trees are beautifully green now it is spring, and some new photos will be published soon. A dishwasher is not listed in the amenities. We do not list a washing machine in amenities. We do list that we offer a laundry service of one load per week free of charge. In addition if guests stay over 7 days all linens are changed by us and bathrooms freshened mid stay along with all rubbish removed as we believe that everyone in the group should be on holiday. Two of the bathroom have "wet room" style showers. These were chosen because people often wonder about the cleanliness of shower curtains and shower cubicles can be difficult to keep in optimum condition.These showers are listed in the facilities and shown on the photos. They are always cleaned and checked for functionality before each group arrives, if you had mentioned any problems during your stay we would have rectified it immediately. The public track to the house is owned and maintained by the council and is in good condition. You were advised about the track upon booking and we also advised that normal cars with good ground clearance manage the track very well. 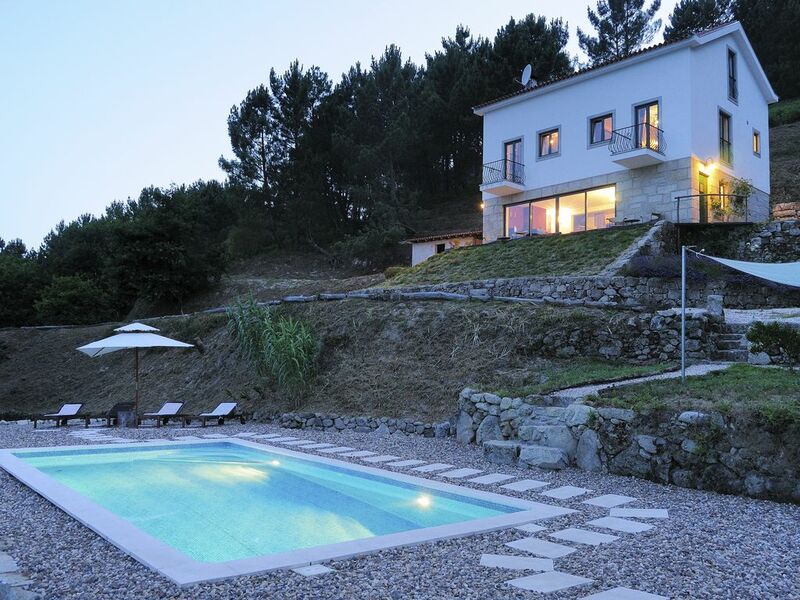 The property is located on a hill, hence the views, we are in the foothills of the Serra da Estrela. We don´t know where you damaged your car but we do know that you chose the extend you day of travel further by visiting your friend in Coimbra for the afternoon thus arriving to us very late at night and very tired. During your stay you managed the track very well on a daily basis and without incident. Homeaway confirmed that you had been properly advised on all the above points and that we did not have to offer you a discount of any sort. As a gesture of goodwill we offered you a very healthy discount if you were leaving the next morning as you had advised. However you wanted as close to a full refund as possible and to stay for your entire holiday. To say we had an great time is an understatement. If your looking for a beautiful oasis to relax in and to get away from the day to day stress this is a great option. We were a group of 8 with 2 seniors, 2 middle aged, 2 twenty somethings, and 2 children and all 8 had an amazing time. The bedrooms are beautifully decorated and had all the emenites needed, a large kitchen and living room when we all wanted to be together and eat, cook, watch TV or chat, but when you wanted quiet time alone each bedroom was a nice getaway. The pool is beautiful and all ages enjoyed it, but certainly the children's screams of excitement were heard as they ran around (apologies to the hosts if they could be heard). The hosts provide bath towels, linens and even pool towels, my husband is the cook in the family and he found everything he needed for cooking indoors as well as outdoors on the griller. At night we slept with the windows and skylights open for an amazing cool breeze even on hot days. The views are spectacular of both the mountains and of the stars at night. The drive up the driveway to the house can be a challenge for an inexperienced driver or a car with a low clearing so keep that in mind, rent a car with a high clearing, but the host was extremely helpful with getting us to the top and bottom with loaded vehicles full of people and luggage. The small town at the bottom near the river has a lovely little grocery, cafe and butcher. If your looking for a night of no cooking and rather dine out there are 2 restaurants within 5-10 minutes, one in the hotel near the grocer (for fine dining) and one set aside down an incline before the small town (of coming from the house) for more casual setting. The hosts were close enough if we needed anything but not intrusive at all. We certainly will be back and plan to have more family vacations like this one and next time longer than 4-5 nights. Thank you for sharing your beautiful property with us. The joy of staying at our Quinta can be to laze by the private swimming pool whilst enjoying the ever changing mountain scenery and the peacefulness and to explore the quaint "lost in time villages" that surround us and the friendliness of the locals. It is possible to be walking in the countryside from the second you leave your door, swim in nearby clear, mountain water fed award winning river beach and savour remarkably inexpensive local food and wine. We are an oasis of peace and calm amidst a troubled world. This secluded villa provides a taste of rural unspoiled Portugal. The land is surrounded by numerous river beaches which are very popular in Portugal with the clear, pure mountain rivers. Activities such as canoeing, horse riding, go-carting, tandem para gliding and skiing are all available in the region. There are festivals most weekends and the hosts will endeavour to find out what is happening during your visit. During the hot summer months guests can relax by the pool watching the eagles soar on the thermals above and enjoy good local Portuguese wine and fare from the barbecue. The villa has a large wood burning fire (wood provided free) full central heating making winter visits cosy. Additionally for your winter break there is a seasonal ski resort in the nearby mountains.As well as the local villages offering café bars and restaurants, the beautiful historic cities of Coimbra and Viseu are about an hours drive away. Our closest city Oliveira do Hospital is a 15 minutes drive with supermarkets, restaurants, shops, cinema etc. Buses are also available.The nearest villages are a 5 minute drive or 20 minute walk, one of which is the beautiful award winning river beach village of Avô where you can explore the village, swim and fish (fishing rod in the house for your use) and enjoy the cafes and local wines (usually around 60 cents a glass). Visiting the Sera de Estrela is a must for every nature / mountain lover. The area consists of old glacial valleys and steep peaks which are a challenge for every climber, but there are also over 32 marked trails for hikers making it the best hiking location in Portugal. For the less active people it might be interesting that the highest point of Portugal's mainland (which is actually a plateau) can be reached by car. A small paved road passes through the entire region and finds it's way up to the peak at Torre. The ski resort is open in the winter with very reasonable day passes rates. The ski resort is 50 minutes from Quinta da Madrugada and the climate here often allows that the non-skiers can sit in the sun in tee shirts whilst the skiers go off into the snow topped mountain resort. This area is filled with beautiful Schist villages who specialise in local cheese, smoked meats and woollen crafts. There are also numerous fresh water beaches. Our own village Avô is especially worth visiting with it's award winning beach and amazing café bar where a glass of wine is still less than a euro and the food they serve is legendary with our guests. The local city of Oliveira do Hospital, offers more restaurants, shops and a cinema. Local festivals fill almost every weekend from spring to autumn ffering ward winning cheeses, smoked meats, local crafts and traditional music and dancing. These festivals are a reminder of the times when Salazar ruled the country (ended in 1974). During his rule people had to have a special pass to visit between villages, unless there was a festival - hence there are festivals for everything from wooden spoons to soup and of course the famous cheese festival at the end of February which is a culinary must. Cycling is becoming a big thing here with big international events taking in the hills and mountains making Quinta da Madrugada with it's secure bike storage, maintenance racks and vehicle support a great place to practise for those big race events. Winter at Quinta da Madrugada often brings sunny days (cold in the shade) and cold evenings, time for that cosy log fire. Spring brings warm scented days filled with wildlife, especially the eagles fledging their young from the wood next to the house. It can be mid 20oC up to 30oC, great for walking and cycling. Summer brings long hot days which can be over 40oC and balmy evening filled with the sound of crickets, this is when your private pool comes into it's own. East facing the house itself cools on an evening ensuring that the rooms are not too hot when it's time for bed. Autumn is the time for walking and cycling, gorgeous sunny days of mid 20's to 30oC with that very faint autumnal smell and a cosy log fire for an evening. This is just one of those places that has something to offer any person who visits! Rates are subject to change until reservation is confirmed with a 25% deposit. In the event of a cancellation by the client the initial 25% deposit is non refundable.